The Employer's Employing Workers Under the Age of 16 List is a child labor law poster by the Missouri Department Of Labor & Industrial Relations. This poster is mandatory for some employers, including employers of minors. This poster must be posted in a conspicuous place where all employees will see it. This poster describes the work and workplace restrictions imposed upon employees of under 16 years of age as well as requiring minors under 16 to have a work certificate or they cannot be employed. This poster also lists the acceptable work hours for employees under the age of 16 as well as where to contact for additional information. It appears you don't have a PDF plugin for this browser. 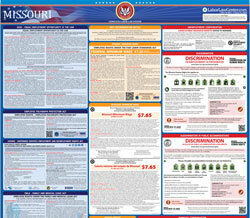 Please see the link below to download missouri-ls-43-ai.pdf.